A sweet, wise, and spacious aliveness imbues every moment. It’s so clear, quiet, and unchanging that it draws no attention. We can go an entire lifetime without noticing it. Yet, it is there. The Buddha called it "Awakening" or the "End of Suffering." He didn’t talk about it but rather taught a way to cultivate the direct experience of it. This experience is what counts. Many contemporary schools of Buddhism have drifted away from the Buddha’s original teachings over the centuries. Now, we can still find His elegant, nuanced, and efficient path. 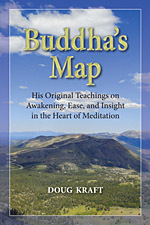 Buddha’s Map is the tale of Doug Kraft’s journey down this awakening path, his experience of spaces within himself he never thought possible. Easy to read yet an elegant combination of autobiography and instruction, Buddha’s Map offers rare and intimate insight into the meditative states Buddhist monks are not allowed to discuss. With clear and direct advice, Kraft shares his belief in everyone’s capacity to experience the ultimate in the original Buddhist meditation practice. The Buddha’s meditation begins by becoming more keenly aware of our immediate surroundings. To do this, we relax the tension of distracting thoughts and feelings so we can see with greater clarity. As our ease deepens, the mind-heart unhooks from the world. We see the mind itself and how its attention moves impersonally from one object to another. As serenity becomes even more pervasive, the processes of memory and perception relax so much that they cease for short periods. Subjectively we black out. We emerge from these cessations with a consciousness that is luminous, precise, selfless, and pervaded with joy. This happiness is not dependent on anything in the world. It is unconditional and lasting. This description may sound strange. But despite the limitations of language, if we follow the Buddha’s instructions, the actual experience is more accessible than we might imagine. In this book we’ll explore in detail the practical steps along the way. The path unfolds in stages that the Buddha called “jhānas.” A jhāna is a depth of knowing based on direct experience. Jhānas are markers along the route. Some schools of Buddhism teach that jhānas are about absorption, where the mind is so concentrated on a single object that everything else is blotted out. Such one-pointed absorption can be blissful. But it’s temporary. It’s a dead end. It doesn’t lead to wisdom or to a deepening understanding of how the mind works. How could it? In one-pointed concentration, the mind is not allowed to move. The Buddha tried, mastered, and rejected one-pointed concentration in favor of a mind and body that are deeply relaxed and at ease. In the earliest suttas (discourses), he encourages a consciousness that is open, receptive, and mindful rather than single-focused. Along this path, a common mistake is to try too hardto try to force the mind-heart into stillness rather than allow it to settle into natural ease and joy. To be sure, this path requires effort. But it does not require strain or rudely shoving attention back to the breath or some other object of meditation. When the mind’s essential peace is disrupted, it may require some effort to remember to notice and relax the tensions in the body, mind, or emotions. When the mind replays the same fantasy for the hundredth time, it may require some effort not to take it personally, to let go of frustration and self-criticism, and to laugh good-naturedly at ourselves. The Buddha’s path requires effort, but it is a kind and gentle effort. For meditation practice to progress quickly, ease must play a central role.